A process for manufacturing a cooked meat product comprising: a) providing an uncooked meat product to which is added lactide and at least one cinnamate selected from the group consisting of cinnamic acid, salts of cinnamic acid and esters of cinnamic acid; and, b) cooking said meat product under conditions wherein said lactide is at least partially converted to lactic acid or linear dimeric lactic acid polycondensate. Field of the Invention The present invention relates to a process for manufacturing meat products, specifically cooked meat products. More particularly, the present invention defines a process for manufacturing a cooked meat product which exhibits favorable shelf-life stability and excellent resistance against the growth of bacteria, in particular spoilage bacteria such as Lactobacilli. The invention also pertains to a solid mixture or an aqueous composition useful in such a process and to the cooked meat products obtainable thereby. Upon the slaughter or death of the animal intended for human consumption, the cessation of respiration and circulation can allow bacteria to grow unchecked. Such bacteria may already be present as contamination upon the animal when it initially enters a meat processing facility. And further opportunities for bacterial contact arise from both human handling and equipment exposure during the slaughter, processing, and transportation of meat products. Most problematically, the time between the initial opportunity for bacterial contact with meat products and the ultimate consumption of such products by consumers allows for the proliferation of undesired spoilage and pathogenic bacteria. The growth of undesired bacteria on meat presents aesthetic concerns affecting the marketability of meat products. For example, the growth of spoilage bacteria creates undesired odors due to bacterial production of inter alia ethyl esters, hydrogen sulfide, nitrogenous compounds, propionic acid and formic acid. The growth of other such bacteria may also act to discolor the surface of the meat. The shelf-life of a meat product is directly related to the number of spoilage and pathogenic bacteria present on the product's surface. A meat product having a high surface level of spoilage and pathogenic bacteria exhibits a relatively short shelf-life, whereas meat having a low count of spoilage and pathogenic bacteria exhibits an extended shelf-life. It has long been recognized that processing plant sanitation, refrigeration and rapid distribution are not complete solutions to meat spoilage. For instance, in conventional meat processing facilities it is not economically feasible to remove all sources of contact between meat and foreign material such as blood, hair, dirt, manure, mud and vegetative material. Furthermore, perfect environmental conditions to retard bacterial growth cannot be maintained in such facilities. As regards refrigeration, the principle spoilage bacteria - including Pseudomonas, Lactobacillus and Coliform - are psychrotrophs which grow well at from 5 to 15°C. Whilst lower temperature storage can be used, the freezing of meat for extended periods of time has many undesirable effects: when water within meat crystallizes, it causes the denaturing of proteins and other damage to the meat at a cellular level. Thawed meat is also considered to have less desirable texture, taste and consistency than fresh meat. The present invention is concerned with the control of spoilage and pathogenic bacterial growth on cooked meat products - and therefore the extension of the shelf-life of that meat - through the use of chemical agents. More particularly, the present invention is concerned with controlling the growth of inter alia Lactobacillus by exposing such bacteria to organic acid. As described in Ammor et al. Food Control 17 (2006) 454-461 , the anti-bacterial effect of organic acid arises from the reduction of environmental pH as well as from the action of the un-dissociated form of the acid. It has been postulated that low external pH causes acidification of the cell cytoplasm while the un- dissociated acid, being lipophilic, can diffuse passively across the cell membrane. The un-dissociated acid acts by collapsing the cell electrochemical proton gradient and by altering the cell membrane permeability, thereby disrupting cellular transport systems. The treatment of meat with organic acids is however associated with a number of disadvantages: the treatment may detrimentally affect the taste of the meat, its structure and yield. The chemical treatment of meat using latent or encapsulated acids does mitigate certain of these disadvantages. WO 2008 / 155323 (Purac Biochem BV) describes a process for increasing the shelf-life stability of cooked meat by combining an uncooked meat product with an organic acid salt and a latent acid, followed by cooking the meat product, the latent acid being a compound which does not show acidic properties when it is added to the uncooked meat product, but which is at least partially converted to a carboxylic acid with at least 3 carbon atoms under the conditions prevailing during the cooking of the meat product. The organic acid salt used is selected from lactate salts, acetate salts, and combinations thereof. EP 0687417 (Frisco Findus AG) describes a process for inhibiting pathogenic bacterial growth in chilled cooked meat products which comprises mixing an encapsulated product in particulate form comprising capsules containing acetic acid within an edible lipid with the meat product formulation before cooking. The present inventors have recognised a concern about the use of lactic acid in either a latent or encapsulated form. Bacterial strains can show adaptation to low pH and consequently there may be selection for acid tolerant bacteria. While Listeria monocytogenes and some meat-borne spoilage genera, such as Pseudomonas sp. and Brochothrix thermosphacta may be effectively reduced by lactic acid treatment, the competitive mesophilic enterobacteria and Lactobacilli flora show relatively greater resistance to the acid and can thereby occupy vacated bacterial niches. A need in the art has thus been recognized to develop additional strategies for the treatment of meat products using latent lactic acid and which can serve to mitigate the selection for acid tolerant bacteria and, in particular, to reduce the growth of lactic acid bacteria. b) cooking said meat product under conditions wherein said lactide is at least partially hydrolyzed to lactic acid or linear dimeric lactic acid polycondensate. The cinnamate component is typically added to said uncooked meat product in an amount of from 0.01 to 2 wt.%, calculated on the weight of the final meat product. Usually, the lactide is added to said uncooked meat product in an amount of from 0.01 to 5 wt.%, calculated on the weight of the final meat product. Preferably, any added lactide consists of L-lactide and / or D-lactide and, more preferably, the added lactide consists only of optically pure L-lactide or D-lactide. In accordance with a second aspect of the invention, there is provided a cooked meat product obtainable by the above defined process. The application of lactide in combination with the cinnamate compound(s) results in a cooked meat product which demonstrates superior resistance against the growth of spoilage bacteria. The suppression of spoilage may be noted by the absence of evidence of growth of spoilage microorganisms and, in particular, of Lactobacilli, as demonstrated by turbidity, viable count, direct microscopic count and other standard methods of enumeration; such suppression may also be noted from the absence of any discernible change in the product attributes - such as texture, odor and appearance - that could routinely be attributed to spoilage microorganisms. Without being bound by theory, it is proposed that the cinnamate compound(s), in the presence of the lactide as a latent acid, may act to inactivate essential enzymes of the microbes, particularly those bearing sulfhydryl groups and which may be involved in production of ATP and in the control of glucose uptake. Any synergistic interaction of lactide, cinnamate and said ingredients i) and ii) is of particular interest because of the fact that, with relatively small amounts of the ingredients - which thereby minimizes each ingredient's negative properties - a relatively large preservative effect can be achieved. Without being bound by theory, it is postulated that the antimicrobial mechanism of the cinnamate compound(s) may be complimented, in the presence of lactide as a latent acid, by the mechanism of ingredient i) and / or ingredient ii). Upon lowering the environmental pH through the action of the latent acid, vanillin and / or nisin may act to perturb bacterial cytoplasmic membranes, with any creation of pores through said membrane resulting in depletion of the proton motive force and loss of cellular ions, amino acids and ATP. In an embodiment, ingredient i) is added to said uncooked meat product in an amount of from 0.005 to 0.5 wt.%, preferably from 0.01 to 0.1 wt.% calculated on the weight of the final meat product. And, in a still further embodiment, nisin is added to said uncooked meat product in an amount of from 2000 to 10000, preferably from 4000 to 8000 IU of nisin per gram of uncooked meat product. It is noted that these defined amounts of ingredients i) and ii) are not mutually exclusive: they may be applied for a given ingredient irrespective of the addition or non-addition of a further ingredient to the uncooked meat product. In performing the above process, it is preferred that at least a portion of the lactide be admixed with one or more of the active ingredients before addition to the uncooked meat product. This presents the possibility that at least a portion, and preferably all of the lactide and at least a portion, and again preferably all, of the cinnamate compound(s) are pre-mixed prior to being added to the uncooked meat product in step a) of the process. In accordance with a third aspect of the invention, there is provided a particulate, solid mixture suitable for adding to an uncooked meat product in the manufacture of cooked meat products, which mixture comprises lactide and at least one cinnamate selected from the group consisting of cinnamic acid, salts of cinnamic acid and esters of cinnamic acid. The term "comprising" as used herein will be understood to mean that the list following is non-exhaustive and may or may not include any other additional suitable items, for example one or more further feature (s), component (s), ingredient (s) and / or substituent (s) as appropriate. As used herein, "and/or" refers to and encompasses any and all possible combinations of one or more of the associated listed items. When amounts, concentrations, dimensions and other parameters are expressed in the form of a range, a preferable range, an upper limit value, a lower limit value or preferable upper and limit values, it should be understood that any ranges obtainable by combining any upper limit or preferable value with any lower limit or preferable value are also specifically disclosed, irrespective of whether the obtained ranges are clearly mentioned in the context. The words "preferred" and "preferably" are used frequently herein to refer to embodiments of the disclosure that may afford particular benefits, under certain circumstances. However, the recitation of one or more preferable or preferred embodiments does not imply that other embodiments are not useful and is not intended to exclude those other embodiments from the scope of the disclosure. As used herein, "meat" refers to edible flesh of animals that is acceptable for human consumption including, but not limited to, pork, beef, veal, lamb, mutton, buffalo, deer, elk, moose, reindeer, caribou, antelope, rabbit, chicken, ostrich, duck, turkey, geese, pigeon, grouse, Guinea fowl, quail, pheasant, and fish or shellfish. Non-limiting examples of suitable fish or fish products include saltwater and freshwater fish, such as, catfish, tuna, salmon, bass, mackerel, pollack, hake, tilapia, cod, grouper, whitefish, bowfin, gar, paddlefish, sturgeon, bream, carp, trout, surimi, walleye, snakehead, and shark. In an exemplary embodiment, the animal meat is from beef, pork and / or turkey. Meat includes striated muscle which is skeletal or that which is found, for example, in the tongue, diaphragm, heart, or esophagus, with or without accompanying overlying fat and portions of the skin, sinew, nerve and blood vessels which normally accompany the meat flesh. The term meat is further intended to encompass "animal by-products" including but not limited to organs and tissues such as lungs, spleens, kidneys, brain, liver, blood, bone, partially defatted low-temperature fatty tissues, stomachs, intestines free of their contents, and the like. The term "meat product" means meat produced by, subjected to or resulting from a process. However, it will be understood by one skilled in the art, that an uncooked meat product is processed animal flesh which has not been subjected to an elevated temperature which results in a significant modification of the protein structure. Noting that condition, the present invention does not preclude the uncooked meat product from being pre-treated, prior to the addition of the aforementioned ingredients, by one or more of: water washing; water spraying; condensing steam treatment; vacuuming; and, combinations thereof. Still further, the term "meat product' is intended to encompass: whole or intact cuts; non-intact meat products; emulsified meat; formed or restructured meat; mechanically separated pork or poultry; mechanically deboned meat (MDM); comminuted meat; lean-finely textured beef (LFTB); and, finely textured beef (FTB). The term "comminuted meat' as used herein refers to a meat paste that is recovered from an animal carcass. The meat, on or off the bone is forced through a deboning device such that meat is separated from the bone and reduced in size. The meat is separated from the meat/bone mixture by forcing through a cylinder with small diameter holes. The meat acts as a liquid and is forced through the holes while the remaining bone material remains behind. The term "mechanically deboned meat (MDM)" as used herein refers to a meat paste that is recovered from beef, pork and chicken bones using commercially available equipment. MDM is a comminuted product that is devoid of the natural fibrous texture found in intact muscles. The term "meat product" is also intended to encompass fresh meat, frozen meat and freeze-dried meat. The present invention has particular applicability to meat products selected from the group consisting of: sausages; frankfurters; bologna; loaves or luncheon meats; and, turkey rolls. The terms preserving, preserve(d), curing, and cure(d), as they relate to the invention described within, mean any improvement in the amount of time that the meat or meat product treated with the preservative or curing agent can be safely stored (e.g., shelf-life), or remains sensory, organoleptic, or color- acceptable, when compared with meat or meat products that have not been cooked, cured, preserved, or treated with any shelf-life extending agent. The compounds and ingredients which may be added in the present invention to preserve the cooked meat product are described in greater detail herein below. Lactide (CAS 4511 -42-6 and 95-96-5) is the dimeric, cyclic ester of lactic acid which exists as three optical isomers: L-lactide formed from two L-lactic acid molecules; D-lactide formed from two D-lactic acid molecules; and, meso-lactide formed from L-lactic acid and D-lactic acid. One, two or three of said isomers may be included in the meat additive. At room temperature and pressure, lactide is a white, almost odorless, hygroscopic powder. It is however noted that the melting points of L-lactide and D-lactide are both approximately 98°C, while that of meso- lactide is approximately 40°C. Therefore, in applications where it would be advantageous for a lactide powder to flow freely and have good workability at or near to room temperature, it is preferred for the level of meso-lactide to be as low as possible and preferably for the lactide to consist of L-lactide and / or D- lactide. In an embodiment, the lactide consists only of optically pure D-lactide or optically pure L-lactide. As is known in the art, lactide is usually produced by a reaction distillation method: lactic acid is subjected to dehydration condensation to obtain a polylactic acid having a relatively low molecular weight; this intermediate is then depolymerized and cyclized to form a lactide; and, this lactide is isolated as a vapor from the system of reaction. In such a production method, the lactide vapor can contain not only L-lactide and/or D-lactide and meso-lactide, but also impurities such as lactic acid monomer, linear dimeric and trimeric lactic acid polycondensates, saccharides, amino acids and fatty acids. The presence of meso-lactide, lactic acid and low molecular weight, linear lactic acid polycondensates in a given lactide product can promote the early development of latent acidity when that lactide is employed as a food additive. Moreover, the presence of saccharides, amino acids and fatty acids may cause deterioration or change in the taste of the food additive, or a problematic coloring of that additive. Accordingly, it is preferable that the concentrations of meso-lactide and / or of the noted impurities be as low as possible within the lactide as applied to the uncooked meat product. Various methods of purifying crude, synthesized lactide are known in the art such as recrystallization, melt-crystallization, rectification and water extraction. Instructive disclosures in this regard include but are not limited to: US Patent No. 6,313,319 B1 ; Japanese Examined Patent Publication No. 51-6673; Japanese Laid-Open Patent Publication No. 63-101378; Japanese Laid-Open Patent Publication No. 6- 256340; and, Japanese Laid-Open Patent Publication No. 7-165753. The lactide ring can be hydrolyzed back to two free lactic acid molecules, thereby acidifying the substrate or medium to which the lactide has been applied: the strong latent acidity released by the lactide is due to the low pKa of lactic acid and to the release of two acidic functions per mole. The hydrolysis of lactide may also result in the formation of linear dimeric lactic acid polycondensate (lactyl lactic acid), which results in the release of one acidic function per mole. The amount of lactide added to the uncooked meat product will depend inter alia upon the desired decrease in pH of the meat product and the composition of the meat. Herein, the lactide is added in an amount which is sufficient to decrease the pH of the meat product after cooking by at least 0.1 pH units, compared to the pH of the same meat product after cooking but without addition of the acid. Where appropriate, the pH of the meat product after cooking is decreased by at least 0.2 pH units. The pH of the meat product after cooking should generally be in the range of from 5.3 to 6.5, and more usually be from 5.7 to 6.2. Determining the exact amount of lactide to be added based upon the desired reduction of pH or the final pH of the meat product after cooking is considered to be within the standard abilities of a person of ordinary skill in the art. Alternatively or additionally, the lactide may be added to the uncooked meat product in an amount of from 0.01 to 5 wt.%, calculated on the weight of the final meat product, preferably from 0.01 to 3 wt.%, more preferably from 0.01 to 2 wt.%. A particularly preferred amount of lactide of from 0.01 to 1 wt.% is noted. The lactide may be added to the uncooked meat product in solid form or dispersed or dissolved in a liquid medium, such as an aqueous liquid medium. The lactide or a portion thereof may be so added separately from the other additive ingredients but it is preferred that the lactide be added in admixture or combination with one or more of those ingredients. The term 'cinnamate' as used herein refers to cinnamic acid and the salts and esters thereof which contain the 3-phenylacrylate (C9H7O2) group. Cinnamic acid (3-phenyl-2-propenoic acid) is well known as a food ingredient, which was generally recognised as safe (GRAS) by the Flavor and Extract Manufacturers Association of the United States (FEMA) - that is the ingredient obtained FEMA-GRAS status - in 1965. Suitable esters of cinnamic acid of use in the present invention include: isoamyl cinnamate; benzyl cinnamate; butyl cinnamate; propyl cinnamate; ethyl cinnamate; and, methyl cinnamate. Whilst in principle any cinnamate salt might be used, typically the cinnamate salts useful in the present invention will be water soluble. In particular, the cinnamic acid salt should be selected from the group consisting of sodium cinnamate, potassium cinnamate and mixtures thereof. A preference for potassium cinnamate is acknowledged. The cinnamate ingredient should be added to the uncooked meat product in an amount of from 0.01 to 2 wt.%, preferably from 0.05 to 1 wt.%, calculated on the weight of the final meat product. A particularly preferred amount of the cinnamate ingredient ii) of from 0.05 to 0.5 wt.% is noted. The cinnamate ingredient may be added to the uncooked meat product in solid form or dispersed or dissolved in a liquid medium, e.g., an aqueous liquid medium. Cinnamate may be added simultaneously with the other additive ingredients and/or separately therefrom. Where applicable, it is noted that distinct cinnamate compounds may be added to the uncooked meat products independently of one another or in admixture. Aside from esters and salts, a number of other derivatives of cinnamic acid are known and used in the food industry, including p-dimethylaminocinnamate, cinnamaldehyde, cinnamyl acetate, cinnamyl alcohol, cinnamyl benzoate, cinnamyl cinnamate, cinnamyl formate, cinnamyl isobutyrate, cinnamyl isovalerate and cinnamyl phenylacetate. The present invention does not preclude the use, in an amount of up to 1 wt.%, calculated on the weight of the final meat product, of one or more such derivatives in combination with the aforementioned cinnamic acid and salts or esters thereof. The present invention also does not preclude the use, in an amount of up to 1 wt.%, calculated on the weight of the final meat product of one or more hydroxycinnamates selected from the group consisting of: coumaric acid; sinapic acid; caffeic acid; ferulic acid; chlorogenic acid; and, the salts or esters thereof. Vanillin and/or one or more derivatives of vanillin may be added to the uncooked meat product as optional adjuncts to the recited lactide and cinnamate. Vanillin (4-Hydroxy-3-methoxybenzaldehyde) is approved as a food additive by authorities worldwide and was given FEMA-GRAS status in 1965. In the present invention, the preservative function of vanillin may be obtained by adding to the uncooked meat product: a natural extract containing vanillin; purified natural vanillin; or, synthetic vanillin. Natural vanillin is expensive due to its limited worldwide production and labour intensive manufacturing, therefore the use of synthetic vanillin is preferred. The majority of synthetic vanillin is derived from lignin, eugenol or guaiacol. R1 is a C1-C6 alkyl group, for instance methyl; Y is -OH or -OR2, where R2 is a benzyloxyl group or a carboxybenzyloxyl group; and, Z is a C1-C6 alkyl group, -COOH or -0-(-CH2-)q-COOH, where q is an integer of from 1 to 9. Exemplary compounds in accordance with this formula include: methylvanillate; methylisovanillate; methylhomovanillate; ethylvanillin; ethylvanillate; 2-(-benzyloxy)-5-formylbenzoic acid; 2-(4- carboxybenzyloxy)-5-formylbenzoic acid; 2-formylsalicylic acid; and, 2-carboxybutoxy-6- hydroxylbenzaldehyde. In an embodiment of the invention, this ingredient i) as added to the uncooked meat product comprises one or more of: vanillin; methylvanillate; methylisovanillate; methylhomovanillate; ethyl vanillin; and, ethylvanillate. Nisin is a further optional adjunct ingredient to the recited combination of lactide and cinnamate. Nisin is a heat-stable polypeptide containing lanthionine which has a cyclic thioether structure and is produced by certain strains of Streptococcus lactis. It is available commercially as an impure preparation, Nisaplin™, from Aplin & Barrett Ltd., Dorset, England and can be obtained by isolating naturally-occurring nisin from cultures of Streptococcus lactis and then concentrating the nisin according to known methods. Further reported methods for producing nisin using altered strains of Streptococcus are disclosed in US Patent No. 4,716,115 (Gonzalez et al. ), the disclosure of which is herein incorporated by reference. It is also expected that nisin may be produced by recombinant DNA technology. The World Health Organization Committee on Biological Standardization has established an international reference preparation of nisin, and the international unit (IU herein) is defined as 0.001 mg of this preparation (WHO Technical Report Series 384, 1968). Nisaplin™ as mentioned above, contains 1 million IU per gram. Toxicological evaluation by the Joint FAO/WHO Expert Committee of Food Additives noted in 1968 that evidence then available indicated that a level of 3,300,000 IU of nisin per kilogram of bodyweight had no adverse effect. This finding permits an unconditional acceptable daily intake (ADI) of 3300 mg of the reference preparation per kilogram of bodyweight, at which level nisin has no microbiological, toxic, or allergic effects. When employed in the present invention, the level of nisin should be from 2000 to 10000, preferably from 4000 to 8000 IU of nisin per gram of meat product. Alternatively or additionally, the nisin may be added in the amount of from 50 to 250 parts per million weight, preferably from 100 to 200 parts per million weight per gram of meat product. The nisin may be added to the uncooked meat product in solid form or dispersed or dissolved in a liquid medium, e.g., an aqueous liquid medium. The nisin may be added simultaneously with the other additive ingredients and/or separately therefrom. The present invention does not preclude the use in addition to nisin and in a total amount of up to 250 parts per million weight per gram of meat product, of further peptide bacteriocins containing lanthionine. More particularly, the added preservative may further comprise, in addition to nisin, one or more of: pediocin; subtilin; epidermin; cinnamycin; duramycin; ancovenin; and, Pep 5. These bacteriocin peptides are each produced by different microorganisms. On the basis of their analogous molecular structure, the use of subtilin and/or epidermin is preferred herein, said bacteriocins being obtainable from certain cultures of Staphylococcus epidermis as described on Hurst, A., Advances in Applied Microbiology 27, pages 85-123 (1981) and Schnell et al., Nature, 333:276-278. Functional Additives In addition to the aforementioned compounds, further functional additives may be added to the uncooked meat product to the extent that they do not inhibit the antimicrobial action of those compounds. Such functional additives include emulsifiers, stabilizers, thickeners, vitamins, minerals, proteins, enzymes, lipids, sugars, fibers, preservatives, antioxidants, sequestering agents, flavors, flavor precursors, colorants, color precursors, and further antimicrobials. The functional additives can be either water- soluble, lipid-soluble or soluble in both. Preferably, these additives are on the GRAS list issued by the FDA. The functional additives may, in total, be added in an amount of from 0.01 to 30 wt.%, preferably from 0.1 to 20 wt.%, and more preferably from 1 to 15 wt.% calculated on the weight of the final meat product. Suitable emulsifiers which are useful herein are polyglycerol monoesters of fatty acids, monoacylglycerol esters of dicarboxylic acids, sucrose monoesters of fatty acids, polyol monoesters of fatty acids, phospholipids, and mixtures thereof. Exemplary thickeners include, but are not limited to, maltodextrin, low-methoxyl pectin, sodium alginate, alginic acid, kappa carrageenan, iota carrageenan, lambda carrageenan, gellan gum, methylcellulose, derivatives of methylcellulose, and starches of both natural and modified forms. Suitable vitamins, which can be added to boost the meat product's nutritional value include vitamins A, B including B12, C, K, D and E, riboflavin, niacin, folic acid, biotin, thiamine and mixtures thereof. Suitable minerals include phosphorus, calcium, iron, manganese, sodium, zinc, magnesium, potassium, iodide and mixtures thereof. Exemplary preservatives include, but are not limited to, sorbic acid, potassium sorbate, sodium sorbate, methyl paraben, sodium methyl paraben, potassium methyl paraben, ethyl paraben, sodium ethyl paraben, potassium ethyl paraben, propyl paraben, sodium propyl paraben, potassium propyl paraben, benzoic acid, sodium benzoate, disodium ethylenediaminetetraacetic acid, calcium disodium ethylenediaminetetraacetic acid, dehydroacetic acid, sodium dehydroacetate and potassium dehydroacetate. Suitable antioxidants include, but are not limited to, dl-a-tocopherol, butylated hydroxyanisole (BHA), butylated hydroxytoluene (BHT), propyl gallate (PG), trihydroxybutyrophenone (THBP), nordihydroguaiaretic acid (NDGA), t-butylhydroquinone (TBHQ), catechol, gum guaiac, lecithin, dilauryl thiodipropionate, ascorbic acid (AA), physiologically acceptable salts of ascorbic acid, erythorbic acid, ascorbyl palmitate, and ascorbyl acetal. Suitable sequestering agents include monosodium phosphate, disodium phosphate, sodium hexametaphosphate (SHMP), sodium tripolyphosphate (STPP), sodium pyrophosphate (SPP), citric acid (CA), monoglyceride citrate, 8-hydroxyquinoline, sodium gluconate, catechol, ethylenediamine tetraacetic acid (EDTA), disodium ethylenediamine tetraacetate (Na2EDTA), diethylenetriamine pentaacetic acid (DPTA), and salicylic acid. As suitable supplementary antimicrobial agents might be mentioned sodium hypophosphite (SHP), methyl fumarate, dimethyl fumarate, ethyl fumarate, and diethyl fumarate. The functional additives may be added to the uncooked meat product in solid form or dispersed or dissolved in a liquid, typically aqueous, medium. Whilst any such additive may be added independently to the uncooked meat products, it will be more usual for one or more functional additives to be combined before addition. In an embodiment, one or more functional additives may be admixed with the lactide and cinnamate ingredients and, optionally, with one or more of the aforementioned nisin and vanillin compound(s). In one embodiment of the present invention, the lactide together with the cinnamate, and, optionally further ingredients p), ii)] and functional additives, are combined and that combination is added to the uncooked meat product. The present invention thus also pertains to a solid or liquid aqueous composition, which is suitable for use in the manufacture of cooked meat products and which comprises: lactide; at least one cinnamate selected from the group consisting of cinnamic acid, salts of cinnamic acid and esters of cinnamic acid; and, optionally, at least one of ingredients i) and ii). If the mixture is in solid form, it will generally be in the form of a powder comprising particles of the relevant components. The mixture in solid form typically comprises: from 1 to 80 wt.% of lactide; from 1 to 20 wt.% of said at least one cinnamate selected from the group consisting of cinnamic acid, salts of cinnamic acid and esters of cinnamic acid; from 0 to 20 wt.% of ingredient i); and, from 0 to 20 wt.% of ingredient ii). A particulate solid form of the mixture may be further characterized by having an average particle diameter of from 0.01 to 5000 microns, preferably from 40 to 2000 microns and more preferably from 50 to 1500 microns. Where appropriate, a conventional flow aid may be added to the mixture but it is noted that the particle size mentioned above is determined on the mixture not containing said flow aid. Where an aqueous liquid composition is provided, it is typically in the form of an aqueous dispersion or solution and will usually comprise from 1 to 1000 parts by weight of water per part of the total of the lactide, cinnamate(s) and, optionally ingredients i) and ii) and any further functional additives. In accordance with a first illustrative embodiment of the invention there is provided a particulate solid mixture having an average particle size of from 40 to 2000 microns and comprising, by weight of said mixture: from 20 to 60 wt.% of optically pure L-lactide or optically pure D-lactide; from 1 to 20 wt.% of potassium cinnamate; from 0 to 20 wt.% vanillin; and, from 0 to 20 wt.% of nisin. In accordance with a second illustrative embodiment for the invention, there is provided an aqueous composition comprising, by weight of said composition: from 40 to 90 wt.% of water; from 2.0 to 6.0 wt.% of optically pure L-lactide or optically pure D-lactide; from 0.1 to 2.0 wt.% of potassium cinnamate; from 0 to 2.0 wt.% of vanillin; and, from 0 to 2.0 wt.% of nisin. As mentioned above, the lactide, the cinnamate, and optionally said vanillin, vanillin derivative(s), nisin and /or other functional additives, are added to the uncooked meat product. If one or more of the compounds is added in solid form, it will generally be added in the form of a powder by stirring it through the meat product. Any components added in liquid form can be combined and mixed through the meat product. In the case of pieces of meat, compounds can, e.g. be injected into the meat in aqueous form. To profit from the effects of the invention it is important that the active compounds are present also on the inside of the meat product, and not only on the outside. Adding the compounds by dipping pieces of meat into the solution is therefore generally not an appropriate addition method. Other suitable methods by which the present compounds can be added to the meat product will be evident to meat manufacturers and require no further elucidation here. After addition of the aforementioned mixture, the meat product is cooked. There is no intention to limit the cooking regimens and the cooking apparatus which may be employed. For illustration only, cooking may be carried out by: cooking in a conventional oven; cooking in a convection oven; smoking; steaming; roasting; boiling; broiling; cooking in a slow cooker; halogen lamp cooking; or, any combinations thereof. The cooking apparatus may be at a domestic scale or at a commercial scale, such as that found in butchers or in the meat processing industry. Without intention to limit the present invention, the process step of cooking b) may typically be performed at temperature of at least 60°C, preferably at least 65°C. Illustrative cooking conditions may be constituted by a temperature of at least 60°C and one or more of the following conditions: i) a temperature of at most 200°C or at most 160°C; ii) a pressure of from 0.8 or from 1.0 to 2.0 bar; iii) a cooking time of at least 15 minutes per kg of meat product, for example from 20 to 150 minutes or from 30 to 120 minutes per kg of meat product. For completeness, the conditions i), ii) and iii) are not mutually exclusive and one, two or three of said conditions may be applied in this embodiment. At some point during the cooking, the lactide can be hydrolyzed to free lactic acid molecules or linear dimeric lactic acid polycondensate products. The present invention is particularly attractive for meat products that are commercialized as cooked products in order to extend the shelf life of these cooked meat products. The meat product can be cured or uncured. The present invention is attractive for application in both cured and uncured meat products. The following materials are employed in the Examples: PURASAL® S is the sodium salt of natural L-Lactic acid, provided as a neutral, clear aqueous solution (60% w/w) and which is commercially available from Corbion Purac. Potassium cinnamate (KCin) was obtained as PuraQ Xtend AX66, commercially available from Corbion Purac. Vanillin was obtained from Sigma. Turkey meat rolls were prepared in accordance with the following procedure. Ground turkey breast, divided into nine equal portions, was stored for one day at 0°C. 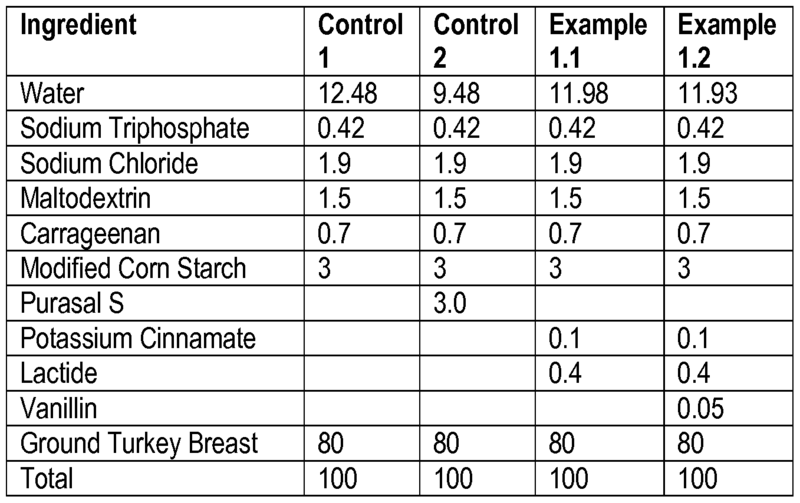 The ingredients defined as weight percentages in Table 1 below, were dissolved in a brine and then added to the ground turkey breast portions. Each brined turkey breast portion was then packed in sealable bags - but not under vacuum - and tumbled for two periods of 2 hours, with 30 minutes rest in between each period. The resultant meat-paste was stored for 16 hours at 0°C in a vacuum bag to allow for brine distribution. Turkey rolls were then prepared by putting the paste in cans and were cooked in a smoke cabinet. The rolls were cooked for 105 minutes at 75 °C and afterwards cooled down with tap water to 15°C. After that the final turkey rolls were stored at 0°C. The pH and yield of the cooked turkey rolls was determined. Based on visual inspection, all rolls had a yield of 100% (no purge). The rolls prepared using lactide had a pH of 5.8; the rolls prepared in the absence of lactide had a pH of 6.2. Sausages were prepared from the dough by putting it in cans and were cooked in a smoke cabinet. The sausages were cooked for 105 minutes at 75 °C and afterwards cooled down with tap water to 15°C. After that, the final turkey rolls were stored at 0°C. Evaluation of Microbiological Resistance In a first step an inoculum was prepared as follows. Cultures of lactic acid bacteria (L. sakei, L. curvatus, L. plantarum, L. mesenteroides, L carnosum) are started from plate and incubated overnight at 30°C in screw-capped tubes (100 x 16 mm) containing 10 ml MRS broth. Sausages were inoculated to a final level of about 1000 (103) CFU per gram of product. The sausage was inoculated with 1 % Inoculum (approximately 5ml Inoculum per 500 gram ground meat). The ground meat was weighed into bag filters, vacuum sealed (Turbovac) and stored at 4°C. At appropriate time intervals, samples of inoculated sausage of each batch are taken in triplicate for microbiological analyses. A bag filter with the sample was opened and 3 times diluted with sterile dilution fluid (8.5 % (w/w) NaCI and 0.1 % (w/v) bacteriological peptone). The mix was homogenized for 1 min. in a Stomacher. Additional dilutions were made also in sterile dilution fluid. 50μΙ of the homogenate or dilution was subsequently plated on MRS agar using an Eddyjet type 1.23 spiral plater (IUL Instruments, Barcelona, Spain). Plates were incubated for 48 hours at 30°C or 72 hours at room temperature. The colonies were counted with the Acolyte Supercount automatic colony counter (Synoptics, Cambridge, UK) using the Synoptics software package. The results of the test are given in Figure 2 appended hereto. Figure 2 shows that the compositions according to the invention, prepared using the combination of lactide with potassium cinnamate, controls lactic acid bacteria during at least 38 days at 4°C storage temperature. This illustrates the advantageous effects associated with the present invention. 2. The process according to claim 1 , wherein said lactide consists of L-lactide and / or D-lactide, preferably wherein said lactide consists of optically pure L-lactide or D-lactide. 3. The process according to claim 1 or claim 2, wherein said lactide is added to said uncooked meat product in an amount of from 0.01 to 5 wt.%, calculated on the weight of the final meat product. 4. The process according to any one of claims 1 to 3, wherein said at least one cinnamate is added to said uncooked meat product in an amount of 0.01 to 2 wt.%, calculated on the weight of the final meat product. 5. The process according to any one of claims 1 to 4, wherein said cinnamate ester is selected from the group consisting of: isoamyl cinnamate; benzyl cinnamate; butyl cinnamate; propyl cinnamate; ethyl cinnamate; and, methyl cinnamate. 6. The process according to any one of claims 1 to 5, wherein said cinnamic acid salt is selected from the group consisting of sodium cinnamate, potassium cinnamate and mixtures thereof. 7. The process according to any one of claims 1 to 6, wherein at least one compound selected from vanillin and derivatives thereof is further added to the uncooked meat product. 8. The process according to claim 7, wherein said at least one vanillin compound is added to said uncooked meat product in an amount of from 0.005 to 0.5 wt.%, preferably from 0.01 to 0.1 wt.% calculated on the weight of the final meat product. 9. The process according to any one of claims 1 to 8, wherein nisin is added to said uncooked meat product in an amount of from 2000 to 10000, preferably from 4000 to 8000 IU of nisin per gram of uncooked meat product. 10. The process according to any one of claims 1 to 9, wherein at least a portion of the lactide is admixed with said cinnamate before addition to the uncooked meat product. 11. A cooked meat product obtainable by the process defined in any one of claims 1 to 10. 12. A particulate, solid mixture suitable for adding to an uncooked meat product in the manufacture of cooked meat products, which mixture comprises lactide and at least one cinnamate selected from the group consisting of cinnamic acid, salts of cinnamic acid and esters of cinnamic acid. 13. The mixture according to claim 12 comprising from 1 to 80 wt.% of lactide and from 1 to 20 wt.% of said cinnamate. 14. 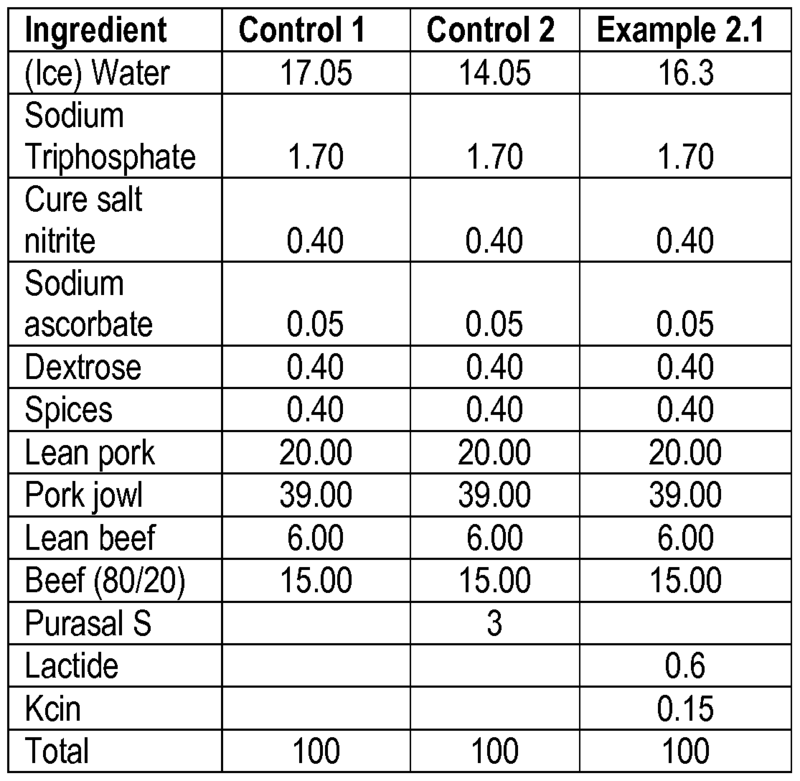 An aqueous composition suitable for adding to an uncooked meat product in the manufacture of cooked meat products, said composition comprising by weight of the composition, from 40 to 90 wt.% of water, from 2.0 to 6.0 wt.% of lactide and from 0.1 to 2.0 wt.% of at least one cinnamate selected from the group consisting of cinnamic acid, salts of cinnamic acid and esters of cinnamic acid.